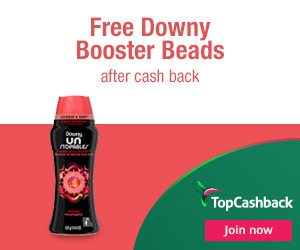 Unfortunately the "Free Downy Unstopables In-Wash Scent Booster Beads" offer is no longer available. Downy Unstopables In-Wash Scent Booster infuses your clothes and fabrics with bespoke freshness befitting a fashionista. Enjoy up to 12 weeks of lasting freshness by simply shaking Unstopables In-Wash Scent Booster into the washer before your clothes, laundry detergent, and softener. It's the ultra long-lasting luxury of Unstopables. Smell like the lifestyle you deserve. 3. Add one (1) Downy Unstopable In-Wash Scent Booster Beads, Spring, 14.8 Oz priced for $8.94 to your cart and checkout. Do not add anything else to your cart. 5. In about 14 days $8.94 will post in your TopCashback account. Offer valid through November 1, 2018.